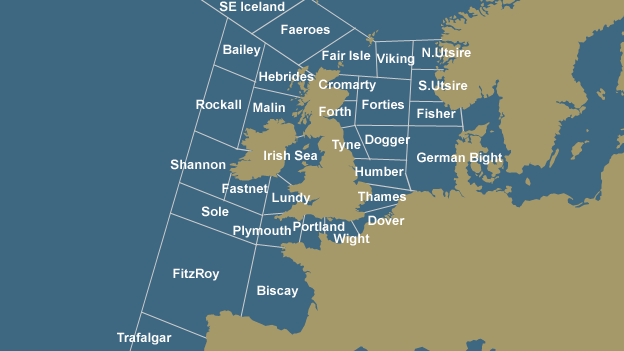 To listen to episodes of the shipping forecast via Radio 4 online, click here. This entry was posted in News and tagged Corrie Corfield, Radio 4, Shipping Forecast, Weather on August 19, 2018 by Thomas. Four times every day, on radios all across the British Isles, a BBC announcer begins reading from a seemingly indecipherable script. “And now the Shipping Forecast issued by the Met Office on behalf of the Maritime and Coastguard Agency,” says the voice over the wire. “Viking, North Utsire; southwesterly five to seven; occasionally gale eight; rain or showers; moderate or good, occasionally poor.” Cryptic and mesmerizing, this is the UK’s nautical weather report. The Shipping Forecast is “part of the culture here,” muses Charlie Connolly, author of Attention All Shipping: A Journey ‘Round the Shipping Forecast. “It’s a much loved institution. People regard it as poetry.” Connolly grew up listening to the forecast. Even now, as an adult, he sets his alarm so he can tune into the early morning forecast. The story of this radio program starts (well before the BBC itself) in the 1850s with a man named Admiral Robert FitzRoy. He was the captain of the Beagle, the ship that brought Charles Darwin to the Galapagos. Continue reading and listen to this episode at 99PI. As many of you know, I’m a big fan of The Shipping Forecast and have featured it in past posts. Thanks for the tip, Eric! This entry was posted in Broadcasters and tagged 99% Invisible, Eric McFadden (WD8RIF), Shipping Forecast on July 30, 2018 by Thomas. Photo by Michael Browning on Unsplash. For the penultimate song on their 1994 album Parklife, Blur chose the swirling, meditative epic, “This Is a Low.” The song envisions a five-minute trip around the British Isles as an area of low pressure hits. “Up the Tyne, Forth, and Cromarty,” sings the lead singer Damon Albarn, “there’s a low in the high Forties.” The song’s litany of playful-sounding place names, including the improbable “Biscay” and “Dogger,” may seem obscure to listeners abroad, but to a British audience, they resonate. The song’s lyrics were inspired by the Shipping Forecast, a weather report that is broadcast on BBC Radio 4 on behalf of the Maritime and Coastguard Agency. Sailors working around the coasts of Britain and Ireland, recipients of the wrath of the North Atlantic and North Sea, are the ostensible beneficiaries of the forecast. Continue reading the full story via Atlas Obscura. SWLing Post readers know that I’m quite a fan of The Shipping Forecast. We’ve posted a number of articles about the Forecast on the SWLing Post in the past–click here to read through our archives. When I lived in the UK, I would often fall asleep and/or wake up to the Shipping Forecast. Here in the States, I can listen to the forecast live via the U Twente WebSDR, but I rarely remember to do so. And, of course, I can navigate to the Radio 4 website and stream current and past forecasts on demand, but I find the audio a little too clean and full fidelity. I prefer listening to my maritime poetry via Amplitude Modulation (AM)! To satisfy my desire for some AM forecasts, this morning I fed my SSTran AM transmitter with audio from the Radio 4 website, then made a recording with my AirSpy HF+ SDR. Click here to download as an MP3. For the record: this is what you get when you combine a radio and shipping forecast geek! This entry was posted in AM, Mediumwave, News, Recordings and tagged Atlas Obscura, BBC Radio 4, BBC Radio 4 Shipping Forecast, Eric McFadden (WD8RIF), Recordings, Shipping Forecast on December 31, 2017 by Thomas. Consternation, mourning and national soul-searching greeted the temporary silencing of Big Ben last week, but at least another favourite fixture of the nightly and early morning radio is to continue. The hymnal cadences of Viking, North Utsire, South Utsire, through Shannon, Rockall, Malin all the way to south-east Iceland, will be heard as usual on Thursday, as the shipping forecast celebrates 150 years of uninterrupted service. The shipping forecast, the longest continuous weather forecast ever made, has been a public service since 1867 when it was used to warn of storms. The warnings were first issued using the electric telegraph until radio became available. Storm warnings were sent over the telegraph wires to harbours, where signals were hoisted to warn ships at sea. When the BBC was formed in the 1920s, the maritime forecast became a fixture of the daily wireless programme where it would remain with occasional modifications and a break during the war when the broadcast was discontinued for fear it would help the enemy. The forecast was still made, however, and disseminated to the Royal Navy. Continue reading the full article at The Guardian. If you love The Shipping Forecast like I do, check out our archived posts. I especially love these posts by SWLing Post contributors Dave Porter (G4OYX) and Kris Partridge (G8AUU) who have both inadvertently caused the shipping forecast to repeat! Long live The Shipping Forecast! This entry was posted in Broadcasters, News and tagged BBC World Service, Droitwich Transmitting Station, Shipping Forecast on August 24, 2017 by Thomas. This entry was posted in Longwave, Mediumwave, News, Nostalgia, Radio History and tagged Longwave, Mediumwave, Met Office, Shipping Forecast on February 16, 2017 by Thomas.